The Sheep and Rat may find themselves drawn to each other even though they are very different. The Rat is a complete socialite. They are highly attractive. The shy Goat prefers the comfort of the home. They are sensual and beautiful. They will find their articulate and expressive lover highly engaging. Much like the Horse or Dragon, the Rat man or woman enjoys the limelight and being the center of attention. The Sheep man or woman is completely content to stand faithfully on the sidelines. These two Chinese zodiac signs can develop a good love compatibility provided they find ways to use their differences to complement each other’s distinct personalities. The exuberant Rat will bring a sense of fun and romance to the Sheep-Rat relationship. The Goat should be willing to remain flexible and allow their partner some freedom. Then their partner will liven up the sometimes gloomy and reclusive bond, bringing some energy to the relationship. In return the Rat may find some comfort and grounding from the emotional connection provided by their partner. The Rat and Goat in love will enjoy a comfortable, well turned out home. The outwardly social male or female Rat relishes meeting friends, both old and new, and will seek opportunities to engage his/her ever-growing group of friends. This could encourage the male or female Goat to be more social. This will greatly help their relationship while they are dating. Over time, they may be able to help their ever outgoing lover understand the importance of intimacy at home. The Sheep-Rat soulmates will need to develop a method for dealing with the collections the Rat is likely to bring home from various excursions. The Goat may see these collections as clutter or hoarding. They will need to carefully navigate through the articles. It may be difficult for them to assimilate these trinkets into their well turned out home. It is unlikely to occur to the Rat that their treasures can appear like clutter to someone as meticulous and artistic as their lover. The Goat has a talent for creating beauty, especially in the home. They will not appreciate the helter-skelter of items their partner may wish to bring home. It will take some planning to avoid hurting their lover’s feelings and maintain the decorum to their satisfaction. Despite the many complements, there are bound to be challenges in a Sheep and Rat friendship, forecast the Chinese compatibility predictions. The curious and well-traveled Rat is much more interested in new and exciting experiences than providing stability and emotional support. Emotional stability and dependence are cornerstones of the Goat’s personality which in itself may be their Achilles heel in this pairing. In bed, the Sheep-Rat might have problems in sexually satisfying each other. The socially active nature of the Rat is bound to cause the shy and passive Goat some concern and even a twinge of jealousy. It is not that they intend to hurt their partner, but this social-seeking person is likely to lead to jealousy or greater insecurity in their lover. The Rat needs a wide variety of interactions and thrives on these experiences to feel alive. Being tied too closely to home or with one person may become a drain on their exuberance. This is the main reason for the Sheep-Rat breakup. This will not lend well to the Sheep’s need for security and emotional commitment. The Sheep and Rat compatibility may struggle to find the right balance. They might need to find an equilibrium between spending time alone and going out with friends and family. However, if the Sheep and Rat marriage is to strike this equilibrium the relationship can be highly rewarding for both. 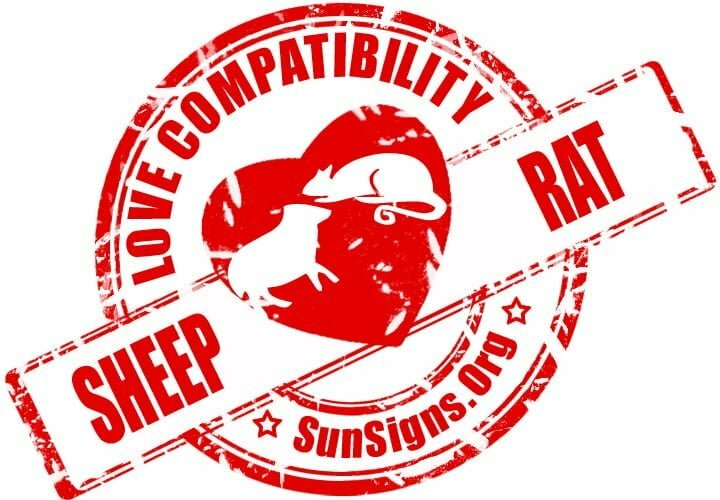 Sheep & Rat Chinese Horoscope Compatibility Rated 2 Hearts!